Nick Goody was in New York facing the Yankees when he heard from an aunt in storm-ravaged Texas that she wasn't OK in her house: "The water is here." 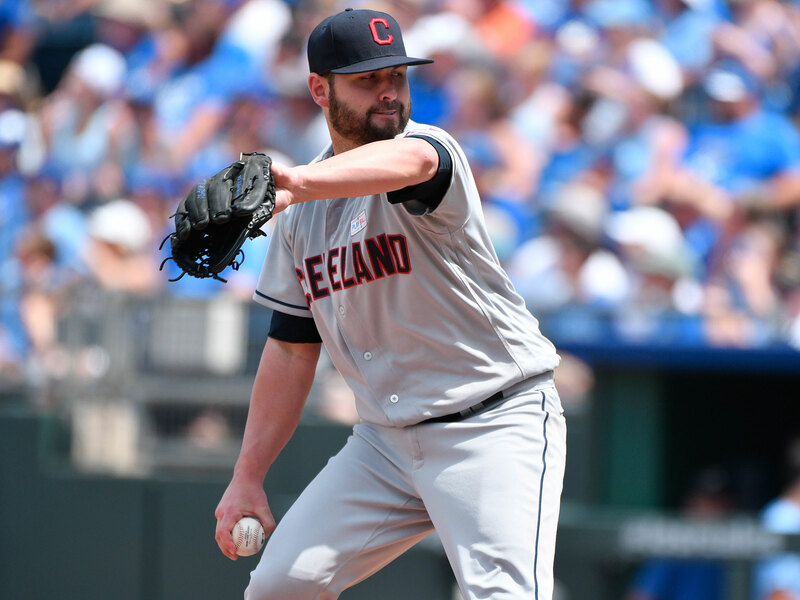 Indians reliever Nick Goody grew up in Orlando, so he's familiar with hurricanes. But the photos his aunt Paula Haynes sent him Tuesday night still frightened him. Goody and his father’s younger sister are close—they text and call one another often, and she likes to watch his games on TV and send him photos of himself onscreen—and he had stayed in regular contact as Hurricane Harvey bore down on Houston, 100 miles west of her home in Nederland. She kept assuring him she and his uncle Kevin were fine, until finally she grew quiet that Tuesday night. Harvey made its second landfall, on the coast just south of Nederland, around the same time Cleveland was finishing a 6–2 win over the Yankees. “Are you O.K. ?” Goody pressed. Goody panicked. Even as a 26-year-old having his first impact season in the major leagues—he has struck out 33.9% of batters, sixth among non-closer relievers—he has become used to having some degree of power in his life. If he wants his uniform pants hemmed to a different length, someone will do that for him. If he wants an expensive dinner, he can afford it. But in this case he was utterly helpless; the Indians were in New York, he had family that was underwater in Texas, and no amount of service time in the big leagues was going to affect that. He did have one resource available to him, he realized: his 6,000-follower-strong Twitter account. “If any1 is in the Beaumont/Nederland area and has a boat,” he tweeted around 1:30 a.m., “My aunts house is flooding. And my family is stuck.” He included his aunt and uncle’s phone number and address. As he worried in the bullpen a few hours earlier, Paula, 42, and Kevin, 46, had been plugging the cracks under the doors with handfuls of towels and blue jeans. (Paula laughs now at her naïveté. “I really thought it was gonna stop it!” she says. “That was an expensive barrier.”) They both work at nearby oil refineries, she in administration, he as an operator, so they were familiar with safety protocols. They unplugged electronics and gathered nonperishables. Then they moved onto more sentimental tasks: collecting photo albums, wrapping a family-heirloom antique Texaco gas pump in blankets. They shepherded their two Yorkies onto the living-room couch. They charged their phones. A few streets over, a family friend’s 21-year-old daughter, Blake-Leigh Dockens, was alone with her own dogs. The Hayneses told her to come over, so she loaded them into her truck and drove to meet them. By the time she hit their street, the house had begun to flood. Clusters of neighbors went house-by-house to turn off breakers in low-lying homes; once water reached electrical outlets, they would have been in real danger of fire or electrocution. The city had only distributed eight sandbags per family, which didn’t do much good. A friend texted after midnight to ask if she was planning to leave. Not yet, she said. There was a local family with six young children that needed to evacuate, the friend said; if the Hayneses decided to get out, could she keep them in mind? Of course, she answered, but she was pretty sure she would ride out the storm. Within another hour, though, the Hayneses had to consider abandoning the one-story, white house Paula’s parents had bought when she was eight. Water was up to their knees, and the rain just wouldn’t stop. They packed a duffle and waited, terrified. Floorboards, wrenched loose by the rushing water, floated down the hallway. So did the dog bowl. Then, around 3 a.m., she heard what she thought was a helicopter in the front yard. She waded outside to discover two members of the so-called Cajun Navy, a grassroots volunteer flotilla, in their 18-foot airboat. Many of its sailors come from eastern Texas and western Louisiana, and many of them saved neighbors—or were saved by neighbors—in the aftermath of Hurricane Katrina. So when Harvey hit, dozens hooked flat-bottomed boats up to trucks and headed to Houston. Google Docs, text-message chains and a walkie-talkie app called Zellow helped them keep track of who needed rescuing. In the Hayneses’ case, it was Goody’s tweet that had alerted a 38-year-old Louisianan named Allen Lenard to their location. Lenard and his friend Jason Sanchez, 32, drove the family to high ground on Highway 96, where relatives met them. In the end they rescued close to 300 people over four days—186 in 10 hours that first night, 45 from the Haynes’s street alone. Many of them were elderly and disabled. They did not see another boat in that neighborhood Tuesday night. They wouldn’t have been there at all if not for Goody’s tweet. When informed of his, he deflects any measure of credit. “Those guys are heroes,” he says. Indians outfielder and Beaumont native Jay Bruce has said he and his wife, Hannah, will match up to $100,000 in donations made to the Cleveland Indians Charities in support of Harvey relief by Sept. 10. Goody has contributed $1,000, the highest figure the website offers. He says he plans to head to Texas after the season ends to help clean up. “The work never ends,” Haynes says. “When you’ve done all you can, you go help someone else."